Gordon Southern is a regular headliner on the UK and international circuit, spending several months every year performing sell out shows in Australia and New Zealand each year. A highly regarded act, he's worked in many exotic & challenging places, including Afghanistan, The Falkland Islands, Kosovo & Liverpool. He's sold out a 700 seat theatre with a solo show in Mumbai, India, headlined the first ever Serbian comedy festival, and has regularly headlined in Singapore, Dubai, Cyprus and New Zealand. 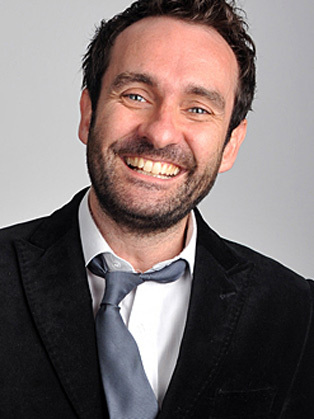 Gordon made his Edinburgh debut in the highly respected Comedy Zone in 1997 and has since gone on to take up several successful and acclaimed solo shows. The critically acclaimed A Brief History of History received nominations at both the New Zealand Comedy Festival and the Edinburgh Festival Fringe. He has enjoyed sell out runs at the Melbourne International Comedy Festival from 2011- 2014. His show The Kerfuffle was a total sell out and nominated for Best Show at Perth Fringe 2014. Gordon also has a Time Out Comedy Award from his days with BBC Radio 4's Cheese Shop comedy sketch team. Over the years Gordon has worked for many high profile corporate clients, writing shows specifically tailored to their needs. A master storyteller and highly awarded comic, this globe trotting actor/comedian deserves to sell out his season in the Adelaide Fringe just as he has in Festivals all over the world. With huge energy, infectious joy and witty inclusion, he weaves his audience into his stories of family, dementia, the perils of shopping at Costco, and colonic irrigations! As observational comedians go, Gordon Southern is on the top shelf. [Gordon Southern is] guaranteed to have a quality hour of material... It is as always a show not to be missed. Hilarious and thought-provoking...Gordon Southern has perfected the tough art of intelligent, provocative humour...definitely a must-see.